Ever since the McKees Rocks-based 5 Generation Bakers broke ground on its new 18,500-square-foot facility in late October, construction has been ongoing in order to transform what was a former Bottom Dollar into a space that will house its commercial bakery, plus a corner market and coffee shop. The facility is creating a lot of buzz around town—residents wondering when they can shop, job seekers wondering when and where they can apply and the company is ready for its much-needed upgrade (equipped with a loading dock and all!). 5 Generation Bakers Founder and President Scott Baker said he hopes to open the new facility mid-April 2016, be producing by May 1 and formally introduce it to the public at a ribbon-cutting ceremony in May or June. He gave us a tour showing us the progress that’s been made and a sneak peek at what’s to come. So far, architectural and engineering drawings are completed, metal framing is up and most of the plumbing, data cabling and electrical work is finished on the facility located at 1100 Chartiers Avenue. 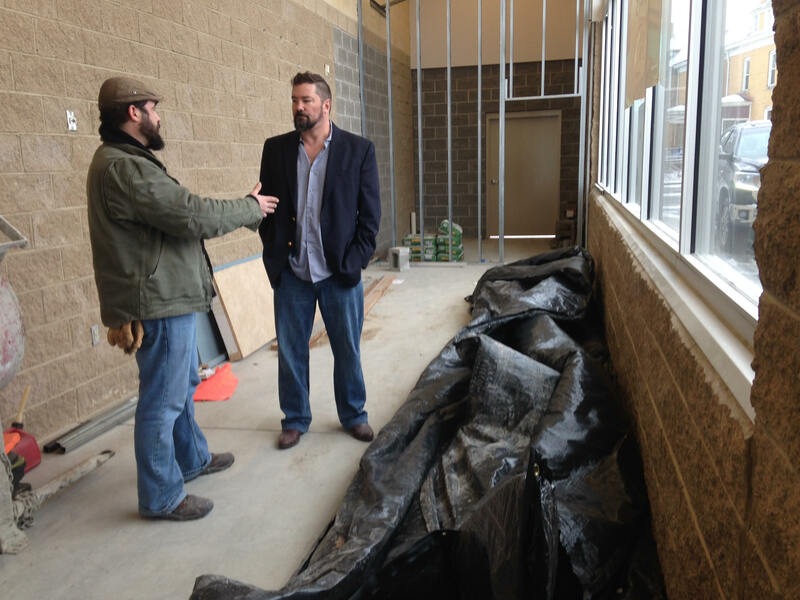 From left: Project Manager Wade Grann and 5 Generation Bakers President Scott Baker stand in the future retail shop. The approximately 400-square-foot retail space, which will welcome customers at the front of the building will have fresh fruits and vegetables for sale, along with food made by local businesses such as Mancini’s bread, convenience items like toilet paper and of course—5 Generation Bakers famous Jenny Lee Cinnamon Swirl Bread. Customers can also look forward to a lunch counter where they can enjoy coffee, donuts, soups and ready-made sandwiches. The business plans on holding a focus group on March 12th to hear from community members on what food options they would like to see in this space. “We want to provide what the community needs,” said Baker. 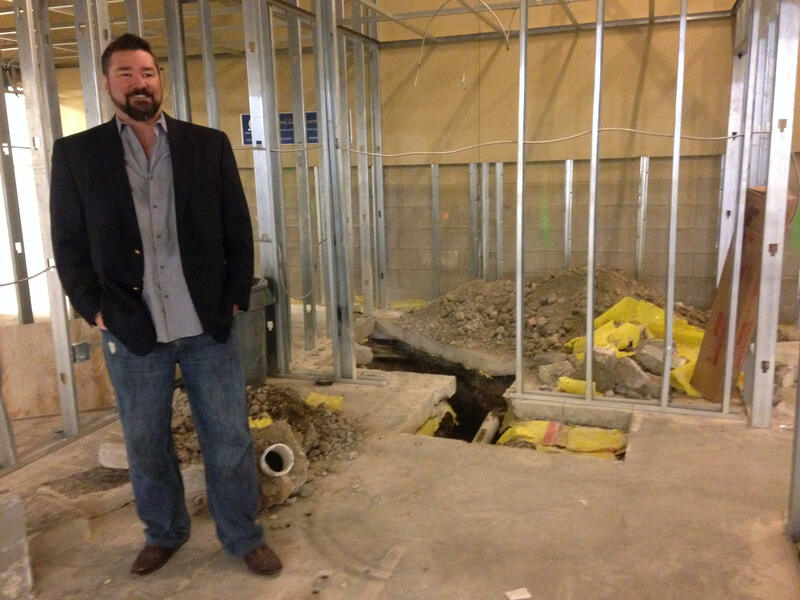 Scott Baker stands inside his future office. Just Harvest, an organization that educates, empowers and mobilizes people to eliminate hunger in communities, is working with 5 Generation Bakers to bring several types of fruit and vegetables to the market. “Likely, this will mean stores will have something along the lines of apples, bananas, oranges, potatoes, onions and green peppers. The goal is to have staple produce items that can be used as either grab and go or in many common recipes,” said Joshua Berman, Just Harvest project coordinator. The market is one of three McKees Rocks stores participating in Just Harvest’s Fresh Corners program, a healthy corner store initiative to improve access to healthy food in Allegheny County neighborhoods. The organization is also working with Rocks Express on Frederick Street and In & Out Corner Market on Helen Street who recently held two high-energy focus groups that provided good input on what kinds of foods community members and stakeholders would like to see in the stores. Owner, Bashir Akhter, will next meet with produce distributors, a store layout consultant and community members who will volunteer to market the campaign. 5 Generation Bakers is also looking to expand a current stock room off of the retail shop, a 2,000-square-foot freezer in the rear and will continue to develop spaces in the facility including an employee break room, company offices and a production space that will house a lot of large equipment ranging from a 48-foot-long production table to four commercial ovens. 5 Generation Bakers is hiring for several positions including bakers, cashiers and in sanitation. Interested applicants should send their resume to denice@5generationbakers.com.